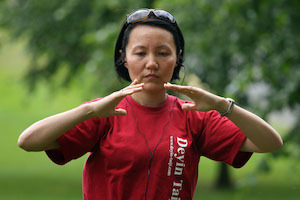 Following on from her 2 minute seated Qigong Faye takes us through a sequence of exercises for the hands, arms and shoulders in addition to some simple, but highly effective self-massage techniques, all of which are performed whilst seated. Faye Yip was born to a traditional Chinese Martial Arts family in Beijing and has, since the age of 7 studied Shaolin Quan, Xingyi, Bagua & Taijiquan under her father (Prof. Li Deyin). She has been teaching in the UK since 1990 and has produced many medal winners. She is President of the British Health Qigong Association.